Get ready for a full day of sightseeing on the 3rd (Fri): explore the world behind art at Peggy Guggenheim Collection, take in the architecture and atmosphere at Basilica di Santa Maria della Salute, then take in panoramic vistas at St Mark's Campanile, then take in the views from Ponte dei Sospiri, and finally admire the landmark architecture of Porta della Carta. To see where to stay, ratings, traveler tips, and more tourist information, read our Venice travel planner. Fresno, USA to Venice is an approximately 23.5-hour flight. The time zone difference when traveling from Fresno to Venice is 9 hours. While traveling from Fresno, expect little chillier days and about the same nights in Venice, ranging from highs of 86°F to lows of 66°F. Finish your sightseeing early on the 5th (Sun) to allow enough time to take a train to Verona. Start off your visit on the 5th (Sun): catch a live event at Arena di Verona, admire the striking features of Giulietta's House, make a trip to Piazza delle Erbe, then take in the spiritual surroundings of Basilica di San Zeno Maggiore, and finally admire the masterpieces at Castelvecchio Museum. To find more things to do, photos, ratings, and more tourist information, refer to the Verona trip planner . Traveling by train from Venice to Verona takes 1.5 hours. Alternatively, you can drive; or take a bus. In August in Verona, expect temperatures between 86°F during the day and 65°F at night. Finish your sightseeing early on the 6th (Mon) to allow enough time to take a train to Florence. Get a sense of the local culture at Galleria dell'Accademia and Uffizi Gallery. Get some historical perspective at Cathedral of Santa Maria del Fiore and Campanile di Giotto. Next up on the itinerary: make a trip to Piazzale Michelangelo, appreciate the extensive heritage of Piazza della Signoria, browse the eclectic array of goods at Mercato di Sant'Ambrogio, and take in the views from Ponte Vecchio. To find reviews, traveler tips, maps, and tourist information, go to the Florence trip maker tool . Traveling by train from Verona to Florence takes 1.5 hours. Alternatively, you can drive; or take a bus. Expect a daytime high around 86°F in August, and nighttime lows around 64°F. Finish your sightseeing early on the 8th (Wed) so you can take a train to Rome. Get a sense of the local culture at Palatine Hill and Vatican Museums. Your inner history buff will appreciate Piazza Navona and Basilica di San Pietro. There's still lots to do: admire the striking features of Pantheon, admire the masterpieces at Sistine Chapel, take a stroll through Trastevere, and steep yourself in history at Colosseum. To find reviews, ratings, traveler tips, and other tourist information, use the Rome trip planning app . Take a train from Florence to Rome in 2 hours. Alternatively, you can drive; or fly. August in Rome sees daily highs of 90°F and lows of 68°F at night. Finish up your sightseeing early on the 12th (Sun) so you can go by car to Ravello. Ravello is a town and comune situated above the Amalfi Coast in the province of Salerno, Campania, southern Italy, with approximately 2,500 inhabitants. 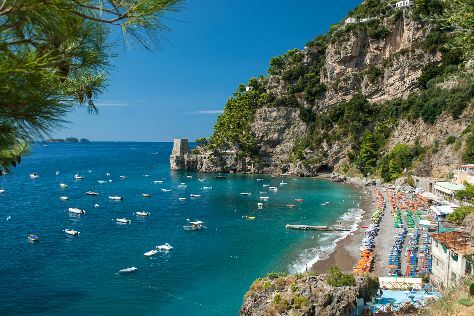 Kick off your visit on the 13th (Mon): stop by Nana' Positano, kick back and relax at Fornillo, and then enjoy the sand and surf at Bagni d'Arienzo. Get ready for a full day of sightseeing on the next day: take in the exciting artwork at Ceramiche d'Arte Carmela, steep yourself in history at Duomo di Ravello, admire the landmark architecture of Villa Rufolo, admire the natural beauty at Villa Cimbrone Gardens, then pause for some serene contemplation at Duomo di Sant'Andrea Apostolo, and finally stop by Ceramiche Cosmolena di Margherita di Palma. For more things to do, photos, traveler tips, and more tourist information, read Ravello trip itinerary builder site . You can drive from Rome to Ravello in 3 hours. Other options are to do a combination of train and bus; or take a bus. When traveling from Rome in August, plan for slightly colder days and somewhat warmer nights in Ravello: temperatures range from 85°F by day to 76°F at night. Wrap up your sightseeing on the 14th (Tue) to allow time to travel back home.